I like to try to let my wife sleep in on the weekends. This requires keeping Miss 4.5 and Master 1.8 quietly occupied, or somewhere away from the house. 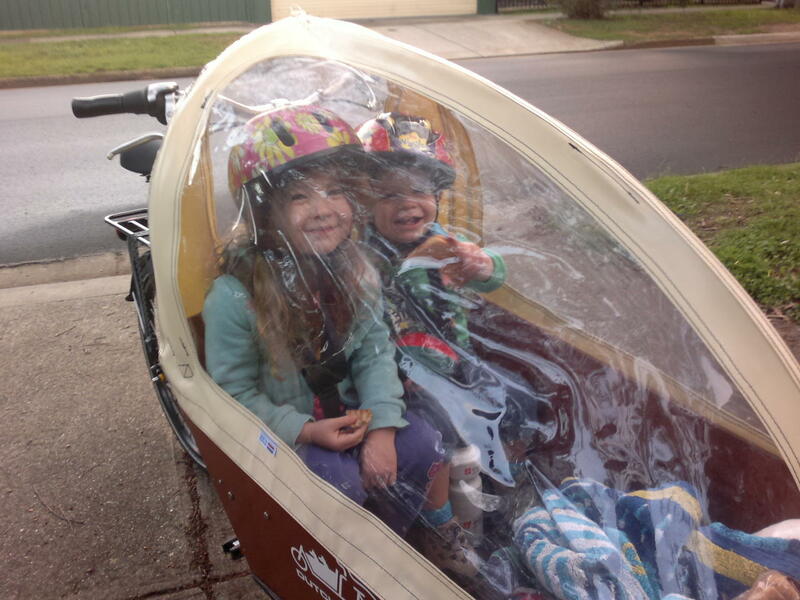 This Saturday was the first time that I had the bakfiets on hand to help, and on this morning I only needed to keep Caleb occupied, as Isabel was staying with Grandma, making the barrier of organisation and child-wrangling a little lower. Brighton beach, and more importantly, the playground just south of Jetty Road, is only about 6km from our place, following bike tracks and cycle-friendly streets the whole way. Playgrounds are a good way to keep our little people occupied, so I made in impromptu plan to take Caleb down there for breakfast and a play. A few months ago I worked out that you can cook porridge while riding a bicycle by using a home yoghurt maker. So one yoghurt maker full of boiling water, brown sugar and oats, a bib, some bread, margarine, water bottle, bowl and miscellaneous cutlery were thrown haphazardly into the roomy box, along with Caleb and helmet. 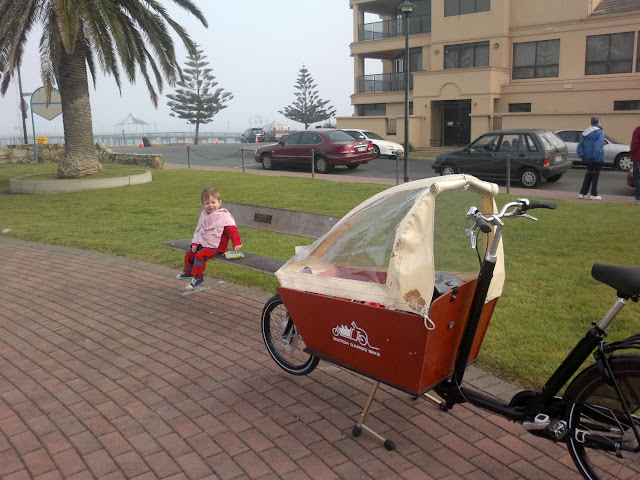 Caleb eating porridge at Brighton Beach, cooked in the bakfiets on the way. Note the mid-winter sea fog hazing the jetty. The morning was foggy, which is quite unusual for the Marion area, and the reason became clear when we approached the beach, with sea fog hovering over coast. 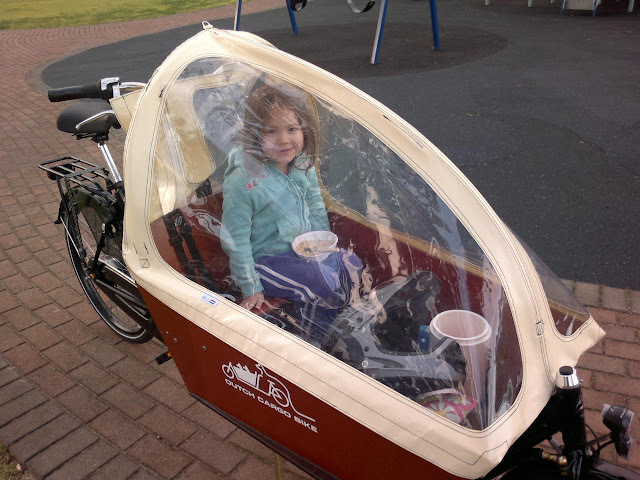 It was really nice riding the bakfiets through the fog, and enjoying the quietness. Then on arriving, it was wonderful for us to be able to tuck into some fresh hot porridge before attacking the swings, ramps and slippery dip. The fog did mean that everything was a bit damp, and Caleb just about reached escape velocity on the slippery dip, his nappy saving him from a sore bottom on reentry, so a mental note was made to pack a towel or two for future visits. The biggest challenge was extracting Caleb from the playground to go back into the bike for the ride home, not because he didn't like the bike, but simply he wanted to stay at the playground. Indeed, within a minute after we pushed off again, he was happily pointing at things and yabbering away. We then repeated the same this morning (Sunday), with both Caleb and Isabel. The porridge process was refined slightly (adding brown sugar before the hot water, instead of the other way around), with pleasing results. Ready for departure for breakfast at the beach. Caleb quite happily had his porridge on the park bench again, but Isabel found the weather too windy, and her hair kept getting in her eyes. This was solved by serving her breakfast under the weather canopy in the bakfiets. Isabel and porridge under the weather canopy. Yoghurt maker and my full-face helmet can also be seen. It took about 20 minutes to get from our place to Brighton beach, just a few minutes longer than driving thanks to the very direct route of the bike path, and better traffic light sequences compared to the car route. Add the benefit of being able to park in the playground, and not having to ferry kids and stuff across the road, and the result was that it probably took no more time than driving. Getting home took about 25 minutes, so probably a little slower than by car. All in all not bad given that it was just my legs moving three people and a 34kg bicycle.